Babs - Land Speed Record Car - featured in The Nelson Lee Library. Homepage. This page: A weekly comic book from 1927, recounting the story of Babs, the 27 litre LSR car. Babs - the Parry-Thomas Land Speed Record car. 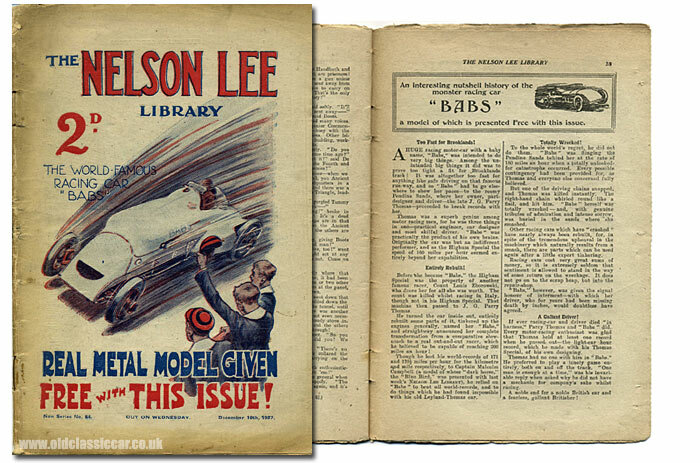 This copy of The Nelson Lee Library comic book is dated December 10th 1927, and was bought due to the cracking illustration of the Babs land speed record car, shown on the cover. Tales of dashing automobilists, risking it all in the pursuit of speed, regularly appeared in the pages of comic books in the 1920s and 1930s, and several such comics have already been looked at in this section of the site. The illustration shows Babs, a 27 litre aero-engine machine, streaking along, in pursuit of the land speed record. J.G. Parry-Thomas grips the wheel, keeping the mighty Babs on course as they sped along Pendine Sands in South Wales. Sadly, by the time of publication, Babs and Parry-Thomas were no more, as a result of a tragic accident that took place at Pendine in March 1927. The story of the car, which, after the crash, was buried forevermore (or so they thought) on the beach, is told within the pages of this copy of The Nelson Lee Library. Babs, it seemed, was lost forever, along with its gallant driver. This is how the story was told, in this vintage comic book, just months after the accident occurred. An interesting nutshell history of the monster racing car "BABS". A huge racing motor-car with a baby name, "Babs", was intended to do very big things. Among the unintended big things it did was to prove too tight for Brooklands track! It was altogether too fast for anything like safe driving on that famous run-way, and so "Babs" had to go elsewhere to show her paces - to the roomy Pendine Sands, where her owner, part-designer and driver - the late J.G. Parry-Thomas - proceeded to break records with her. Thomas was a superb genius among motor racing men, for he was three things in one - practical engineer, car designer and most skilful driver. "Babs" was practically the product of his own brains. Originally the car was but an indifferent performer, and as the Higham Special the speed of 160 miles per hour seemed entirely beyond her capabilities. Before she became "Babs", the Higham Special was the property of another famous racer, Count Louis Zborowski, who drove her for all she was worth. The Count was killed whilst racing in Italy, though not in his Higham Special. That machine then passed to J.G. Parry-Thomas. He turned the car inside out, entirely rebuilt some parts of it, tinkered up the engines generally, named her "Babs", and straightaway announced her complete transformation from a comparative slow-coach to a real out-and-out racer, which he believed to be capable of reaching 200 miles an hour! Though he lost his world-records of 171 and 170.5 miles per hour for the kilometre and mile respectively, to Captain Malcolm Campbell (a model of whose "dark horse", the "Blue Bird", was presented with last week's NELSON LEE LIBRARY), he relied on "Babs" to beat all world-records, and to do things which he had found impossible with his old Leyland-Thomas car. To the whole world's regret, he did not do them. "Babs" was flinging the Pendine Sands behind her at the rate of 180 miles an hour when a totally unlooked-for catastrophe occurred. Every possible contingency had been provided for, as Thomas and everyone else concerned fully believed. But one of the driving chains snapped, and Thomas was killed instantly. The right-hand chain whirled round like a flail, and hit him. "Babs" herself was totally wrecked - and, with genuine tributes of admiration and intense sorrow, was buried in the sands where she smashed. Other racing cars which have "crashed" have nearly always been rebuilt, for, in spite of the tremendous upheaval in the machinery which naturally results from a smash, there are parts which can be used again after a little expert tinkering. Racing cars cost very great sums of money, so it is extremely seldom that sentiment is allowed to stand in the way of some return on the wreckage. It does not go on to the scrap-heap, but into the repair shop. "Babs" however was given the signal honour of interment - with which her driver, who for years had been missing death by inches, would doubtless have agreed. If ever racing-car and driver died "in harness", Parry-Thomas and "Babs" did. Every motor-racing enthusiast was glad that Thomas held at least one record when he passed out - the light-car hour record, which he made with his Thomas Special, of his own designing. Thomas had no-one with him in "Babs". He preferred to play a lonely game entirely, both on and off the track. "One man is enough at a time" was his invariable reply when asked why he did not have a mechanic for company's sake whilst racing. A noble end for a noble British car and a fearless, gallant Britisher! No-one in 1927 could have predicted that in 1969, some 42 years later, Babs would be exhumed, and restored to full working order. It would be another Welshman, Owen Wyn-Owen, that would mastermind the recovery of this amazing land speed record car. In the intervening years, following the crash, a section of the beach had been turned over to the Ministry of Defence, to use as a firing range, and it was within this area that Babs lay. Getting the Army to agree to his plans took time, and deft negotiation, before the green light was given. Until that point, only faded old photographs could hint at how badly damaged and deteriorated the car might be, after such a long "rest" beneath the sands of Pendine. Once exhumed, the true condition of the car could be assessed, and the results were reasonably encouraging. Yes the chassis was badly bent, and the aluminium castings seriously corroded, but that which couldn't be rebuilt would have to be re-made, at not-inconsiderable expense. Amongst other things, a replacement Liberty aero engine had to be sourced, with one from a motor-boat eventually being secured for the project. It would take 15 years for the car to be returned to running condition, as a young teenager I vaguely remember it going on display in a car dealer's window in Stockport, and in more recent times it has featured at the Festival of Speed. A website remembering Parry-Thomas has been created, and can be viewed here: www.parry-thomas.co.uk. Babs herself can usually be found in the Museum of Speed, overlooking the beach at Pendine - well worth a visit it is too, check opening times before making a trip though. Within the comic there is mention of a free Babs model being included - made from a flat piece of metal, there are instructions on how to bend it to make a model of Babs. Do any such models survive I wonder? Babs isn't the only item of interest in this copy of the Nelson Lee Library however, as there is a ripping yarn, totalling six pages, titled Sons of Speed - a fictional tale about racing in the Italian Grand Prix. Return to the car collectables section, or read about other racing items here. Two more copies of this comic, one with Segrave's 1000hp Sunbeam on the cover, and another featuring Campbell's Blue Bird, can now be found on this page of the site.